Mormon Wookiee: #43: My other favorite movie: Groundhog Day! 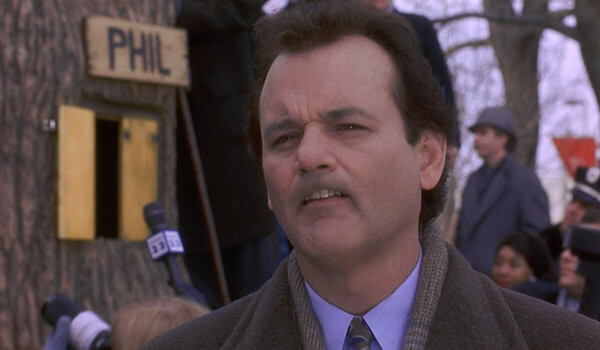 As much as I love "Star Wars", there is another movie I love just as much: "Groundhog Day". No, really. I absolutely love this movie. For those of you unfamiliar with the premise of Groundhog Day, Bill Murray's character Phil Connors is a bitter, cruel, selfish (and hilarious) TV meteorologist from Pittsburgh. As part of his work duties, every year he is forced to go and report on the Groundhog Day celebrations in Punxsutawney, Pennsylvania. And every year he can't wait for the celebration to get over so he can return home. Well, this year, things turn out differently. Phil Connor's best groundhog impression. When Phil wakes up the day after Groundhog Day, he finds out that he is stuck reliving the exact same Groundhog Day from the day before. And then the next day it happens again. And again. And again. And again...for more times than it is possible to count. At first, Phil is in shock. Then he gleefully turns to lust and laziness by taking advantage of others through the knowledge he has gained from his repeated Groundhog Days. As the days wear on, Phil begins to tire of his selfish life, as he realizes that nothing he does has any meaning. He finally reaches a point of despair and takes his own life. However, even then he wakes up the next day. After multiple deaths, Phil slowly begins to realize that there must be something that he is supposed to learn from this experience. Each repeated day, he starts to look for opportunities to improve his own talents and also to help others. He takes care of a hungry old man, he learns how to play the piano, he saves a boy who falls from a tree, he learns French poetry, he performs the heimlich maneuver on a man who is choking, and much more. I won't give you too many details, but in the end, Phil discovers that true happiness and freedom comes only from selflessly serving others. There are a few things I absolutely love about this movie. #1: Bill Murray is a fantastic actor. I actually haven't seen very many of his movies, but for all of his movies that I have seen, he is fantastic (well, except for "Space Jam", but that's forgivable). #2: Ned Ryerson is the greatest movie character of all-time. Below is a clip of all of the Ned Ryerson scenes from the movie. Every year on Groundhog Day, my dad sends me a text picture of Ned Ryerson with the message, "I could watch that movie over and over and over again." Silly dad. I sure love him. What is so powerful about Groundhog Day is the way it lets us experience what it would be like to make a breakthrough like this in our own lives. The movie shows us a character who is like the worst in ourselves. He is arrogant and sarcastic, absorbed in his own discomforts, without hope, and cut off from other people. Like us, he finds himself in an inexplicable situation, seemingly a plaything of fate. But, unlike us, he gets the luxury of being stuck in the same day until he gets it right. Whereas most of us go semi-automatically through most of our (very similar) days, he is forced to stop and treat each day like a world onto itself, and decide how to use it. In the end, he undergoes a breakthrough to a more authentic self in which intimacy, creativity and compassion come naturally - a self that was trapped inside him and that could only be freed by trapping him. Like many of the heroes of fiction, he can only escape his exile from himself by being exiled in a situation not of his choosing. In telling this story, the movie hits on a message that is commonly found elsewhere and that appears to express an essential truth. When we get beyond denial and resentment over the conditions of life and death, and accept our situation, it tells us, then life ceases to be a problem and we can become authentic and compassionate. Without being overtly preachy or religious, Groundhog Day always makes me want to be a better person. It makes me want to change my life so that each day I focus on unselfishly serving others. After all, isn't that what life is really all about? Until next year (or for Phil Connors, maybe until tomorrow), Happy Groundhog Day! This is one of our family's favorite movies too. We quote lines from it all the time. It does send a powerful message about agency and talents and time! Thanks for this great post. I love it, too! Maybe we can watch it tomorrow . . . if there is one. There wasn't one today! Great stuff. Love the Gospel applications of this film. Isn't it awesome that there can be such awesome messages found just about everywhere? I liked this so much I brought it in and showed it to my early morning Seminary class (I was the teacher). I got called in to the bishop's office for that. I guess some people don't get the same message out of it.